It's getting closer and I'm still feeling relaxed. Come what may I'm just going to enjoy it - can you enjoy 26.2 miles run at a pace that you know will hurt come the end? - I can! Thought for the day: Never look down on anybody unless you're helping them up. Well it's just over 63 hours until I have some fun on the run in Luton. I shall be packing my Hawaiian t-shirt, my sunnies and of course, factor 78 sun-block - I shan't be getting sun burnt. I didn't make it down the gym tonight - long day at work and to be honest, race day is so near I might as well try and rest the groin strain as much as possible. Anything I do between now and then isn't going to make much difference. So come race day I shall be taking it - to infinity, and beyond!!!!! Thought for the day: There is no such thing as 'too late' in life. I slacked tonight. I was going to just round the track a few times but after three laps I was bored so joined in with the young ladies - and Dave T.
We ran two 3 minute reps (they did three), two 2 minute reps and one 1 minute rep. It was all very calm and easy until that final 1 minute rep. Round to 200m I was steady, controlled and then .... I lost it big time. I turned on the after burners like you would not believe and sprinted - and I mean sprinted the last 180m. I got to within 20m of the full lap in just 60s - yes, that's 20m of the full lap - and I even started to slow down as I approached the line because I thought I'd missed the whistle. Extrapolating that to a full lap equates to a 63s lap. And considering the first 200m was really rather steady I reckon I've got a sub 60 in me. And to quote from someone - don't know who - I probably shouldn't of done that - but it was fun. Anyway, I'm not doing any more training before Luton. Maybe an easy jog but nothing strenuous. I felt good tonight. Really strong. I've decided, despite the groin strain, to go for it on Sunday. I'm going to start on 21 minute 5k's and see if I can stay the distance this time. If I do I will be sitting pretty on sub three. If I don't then what the heck, there's always the next race. But at the moment I feel invincible and recalling - again - my Nepalese guru's favourite - haven't heard much from him lately - better to have tried and failed than never tried at all. Thought for the day: You don't lose anything from trying but you lose everything if you don't try. Longest ever blog title - 'ave some. Anyway, it was an easy day for me by all accounts. Just a simple gym workout tonight, nothing more. Lift a few weights, have a bit of a natter, half an hour on the bike - you know how it is. My arms are knackered though - I think I overdid the bicep curls - can't undo that now though and I don't think it will affect my legs. Thought for the day: The person who says it can't be done should not interrupt the person doing it. I decided not to run today. I shall be on pacing duty at the Bridge Inn 5k on Tuesday ahead of Luton so I'm not really going to be doing too much in the coming days. I've booked my hotel in the pleasant town of Dunstable - pleasant? Who am I kidding? Anyway, the acommodation is sorted so now it's just a matter of resting, getting there and then setting out fresh and rested next Sunday morning. Thought for the day: You're either part of the solution or part of the problem. Thought for the day: Courage doesn't always roar. Sometimes courage is the quiet voice at the end of the day saying, 'I will try again tomorrow'. Well Mike's session was over at Filton on the track - I is not doin' back to back days of that, no sir. So I went down the gym - my new, lower cost, gym to hit the bike. The gym instructors didn't like that and told me to stop or they'd phone the police. So I hopped on board instead and put in 45 minutes of hard graft. I don't know what it is but the bike's down Redwood seem to offer a much greater workout to those at my old gym. Once again my legs were a bit wobbly at the finish - all good training though. Then a quick blast on the good old, dependable concept II rower - rowing machine to the stars - and all round thoroughly bloody good work out. Then I finished off with half hour on the weights - trying to acclimatise to all the new machinery and getting the settings sorted - my biceps are aching like you wouldn't believe - I reckon my arms are two inches longer now. I'm well and truly into my taper ahead of Luton in ten days time. I'm aiming for a relatively easy ten miles on Saturday and then I shall take it as it comes through next week. Thought for the day (this one's a cracker): You cannot milk a cow with your hands in your pockets!? Wow! What a session that was and not only that it was another good turn out - almost a full house - but not quite. Jamie was still buzzing from his cross country exploits on Sunday - fair play - he is a 400m man, after all. We ran three 800's followed by three 500's and finished off with three 300's. And even though I blow my own trumpet - stop it - it was a far far quicker session that I did tonight than I have ever done before. My times were 2:32, 30, 31 for the 8's then 93, 92, 91 for the 5's and 52, 49, 51 for the 3's. Considering my 800m pb is only 2:24 that can't be bad. And the lads were stunned by my 49s 300m - as yellow lightning came tear-arsing down the final hundred metres destroying all in his wake - monumental baby. I cramped up through the line though - but it was worth it - I got to within spitting distance of Sean and Nick. I managed to de-cramp in time for the final one, albeit a bit slower but I wouldn't have got close to the lads on the final one anyway. They absolutely legged it. Jamie, Harry and Danny were all around 46s with Nick and Sean even faster - awesome. Thought for the day: The greatest danger for most of us is not that our aim is too high and we miss it, but that it is too low and we reach it. Another non-training day - that's three in a row. I've been busy though and it's really just been a time issue - or the lack of it. I will be training tomorrow - I wouldn't dare miss my track session. Apologies to Sean for missing Monday, as I'd promised to give him a lift - I hope he got the message via the Chinese whispers that I left - sorry mate. Thought for the day: Nobody made a greater mistake than he who did nothing because he could only do a little. Didn't have time for training today - busy schedule and all - but went up to the Downs to help with the BMC Cross Country race. I got a call from an anxious Rick to find out where the generator was - I was running slightly behind - stop it - but I got there with at least a minute to spare. Then it was straight over to construction work as Me, Jerry and Dave 'Come on, the lights fading' Taylor struggled to put up the tent in the pouring raining during a howling gale - I exaggerate - but not by much. Then it was time for the racing and I dutifully put on my marshals vest and went and took my position in a far corner of some foreign field. Three hours later I was relieved of duty, cold, wet and thoroughly, terribly p@&$ed off - no, not really, but I was cold - and I couldn't feel my toes anymore - thank the lord for my Gortex shoes or they would have been wet as well. It was a top quality field in the men's race - those at the front knew they were in a race and that's for sure - but I'm not sure who won, though - from my far flung corner I coulda seea nuffin. Still, a few runners and parents thanked me - ah, I got a nice warm glow on the inside - shame it wasn't the outside! And good to see Jamie running in the U17 race. He might not have finished first but it's the taking part that counts - my arse is it - never the less, well done to him. Sean placed sixth and it looked like he enjoyed it. I'm now beginning to warm up but my hands are still not operating at full typing speed - maybe in an hour or two - it's all the cold blood running through my veins. Thought for the day: Don't let one cloud obliterate the whole sky. Anyway, I had a great run today. The weather started off overcast but within half an hour it was bright sunshine - couldn't have asked for more. 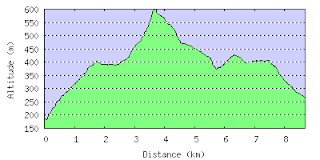 The run turned out to be 26.5k - that's about 16.5 miles in old money - and around 3,000ft of ascent. I know I said I wasn't planning any of the peaks but late on I decided to go off plan and up Tor-y-foel at the end of the run - you can't go to the mountains and not run up one - it'd be rude. There was another couple of sheep worrying incidents with the worst one being me chasing these two sheep, that had obviously escaped from a field, down a track. I was concerned I was about to herd them onto the road and in the end I had to climb into a field to go around them before re-appearing down stream and chasing the pesky devils back a ways - the things you do. Hence the need for me to get some electric shock aversion therapy. And one more thing, why oh why oh why do some people think it's a good idea to fly-tip? Not just that, these fly-tippers were hard-core - we're talking extreme fly-tipping. These scum - yes, scum - go onto the mountains just do dump a load waste. There was a section of the run, about a kilometre long where there was just tons of dumped rubbish - it really p#@$ed me off and got me in a bad mood. But once I was clear of that I calmed down again - oh, I was so angry - I could have burst a blood vessel. Some people - don't deserve to live. Rant over. Thought for the day: Rest satisfied with doing well and leave others to talk of you as they will. ...back to reality. I'm heading over the Bridge again tomorrow, to the Brecon Beacons. I'm going to program up the GPS with a 15 mile route starting by the Talybont Reservoir and heading round in a loop. I'm plotting the route using my OS maps - so I hope the tracks on the map really do exist else it's going to go all cross country on me. I did the same thing up in the Cairngorms and the routes I chose obviously don't get much use except by the occasional mountain goat - I hope these ones are better. 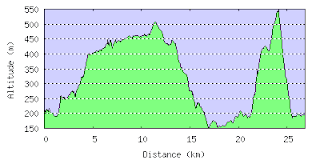 I've tried to pick a flatish course without taking in the peaks but even then it looks like being 3,000ft of ascent - I guess you don't get flat in the Brecons. Thought for the day: My country is the world and my religion is to do good. It was another long day at work but successful never the less and managed to get down my new gym at the end of it all. I signed up tonight. I didn't get out for a run but put in 45 minutes on the bike to try to get a feel for the settings. I tried a routine called cross country. F#&k me was it ever hard - way harder than the other gyms interval session I used to do - and that was a tough session - but this was something else. When I got off my legs were jelly and I had to use all my will power to hold my posture as I walked to changing room so as to not look like a right arse - not that I really care if people think I am or look like an arse. I'm not sure that the cross country setting is going to get selected as my after run session though but it's a damn fine work out - highly recommended. Thought for the day: You shouldn't worry about the fact that other people don't appreciate you. You should worry about not appreciating other people. They're multiplyin' - but I sure as heck wasn't quite losing control. It was cold tonight and at the start my heart wasn't in it. I'm feeling really tired at the moment. I'm not ill or anything (other than the virtual insanity) just tired. Tonight Jamie was back in the fold and we had a new member, Danny. We ran six sets of 400m controlled, 30s recovery then 200m fast with a jog back to the start. I ran poorly on the first couple - here we go I thought - but I actually picked up through the session to finish with some reasonable efforts. My splits were 77, 35 (poor), 74, 33 (not much better), 75, 34 (what the hell is wrong with me? ), 74, 34 (at least I'm not getting any worse! ), 73, 32 (eh up, what's this? ), 71, 32 (where did that come from?). I even managed to chase Sean close on the last couple of 200s. He got a shock when he turned round to see me hot on his heels - groovy. Anyway, I feel much better for the session and I'm glad I went. Just need to find out where Mike's session is tomorrow - if there is one! The BMC Cross Country is on Sunday so there might not be one - anyone care to give me an update? I've decided I'm definitely not going to run the Weston Prom because I have too much lethargy to race. I will just about be able to summon the will to train but not race. Thought for the day: He who awaits much can expect little. Yep, I did indeed do no training tonight - I'm allowed a day off - plus I am knackered and want a good session tomorrow. If I run badly I will have no excuses and will, as punishment, give myself a severe slapping. Oh how mental am I? - don't answer that. Thought for the day: Think, think, think. It will hurt like hell at first, but you'll get used to it. We changed tack tonight and ran a longer one instead of the reps. Starting from the Water Tower on the Downs we ran down(er) to the Portway, along it and looped back up(per) via Stoke hill. The idea was to go out quick along the Portway and then ease back on the return. Things started off OK. Sean and Rick pegged it mind you, no problems there. I brought up the rear - no, enough. Harry and Ed started well but they're not used to the distance and slowed a bit - I did too but I can blame it on having to back mark. On the return I pushed it up the climbs - as only I do, doubling back to meet with H and E. It was on Stoke Hill that I spotted them moving, how shall I put this, less than quickly - if you get my drift. Upon seeing me their pace improved a bit - suspicious. Anyway, I have a rest day planned for tomorrow and then Wednesday's track session. Thought for the day: Those who struggle can fail. Those who don't struggle have already failed. It's that time of year when the call of the cross country is too strong to resist - actually, I could resist without any problem but I thought I'd show willing. So it was off to Bath for the second Gwent League fixture. It was a new course this year, encompassing going up hill seven times instead of the previous four which in theory should play to me strengths. Today, however, my pre-race routine of a night out getting lashed didn't quite work. My head felt awful - which I freely admit is entirely my own fault so I accept the pain without complaint. I started off dead last - nice - but during the first half of the lap (four lap course) my head cleared and I was able to start running in earnest. At the finish I had picked off Graham, Dave T, Brett S and narrowly failed to chase down Mike T and Gareth but I guess I was within 30s of them at the end. All in all it was a satisfactory training race. I think there is plenty more to come. Thought for the day: Everything has beauty, but not everyone sees it. I got out for a ten miler with Jerry this morning - forgot how he fair steams along. I struggled to keep up and was verily puffing good and proper come the end but it's good to get a solid run in. We ran along the river towards Keynsham and then back over the hills. It was a nice little route and a welcome change from my normal haunts. Thought for the day: Behold the turtle. He makes progress only when he sticks his neck out. but then it's quite easy to be a man of your word when you've said you'll have a rest day. In fact, not only was it a rest day it was also a half-day - you little ripper. Alright, I own up, I did make a start of the hall flooring. So it wasn't all feet up and relax. I so lost the enthusiasm for wood flooring after I finished the living room. The interface point into the hallway was a bit fiddly, requiring lots of careful measurement and accurate cutting - suffice to say, not being the worlds greatest diy-er, I put it on ice. Anyway, I decided today was the day and cracked on with it. Now the hard bit is out the way I should be able to zoom on through the rest of it and finally tidy up. Heading out for a medium run tomorrow. Haven't been able to get myself planned up to go over the bridge again and I can't face a long one up at Ashton but I reckon I might survive a 10 miler with my (partial) sanity intact. Thought for the day: No one is useless in the world who lightens the burdens of another. There we go then Nick, I named today's post in your honour - not that you're going to read it today but maybe in a day or two once the 'head' fog clears, eh? Now to tonight's training. Well, I guess the first thing is to say is that I made it. I was undecided yesterday but after the J-myster divulged the secret location of Mike D's session tonight I could hardly duck it could I? So, it was to Sneyd Park and the hill reps of doom - OK, not quite doom - more, the hill reps of mild slopey-ness that get a little bit steeper near the top and then level off again, whew, glad I got that out of the way - harder to name it than run it - alright, that's not exactly true. It was quite hard work tonight. Anyway we ran six hill reps (950m) and my times were 3:48, 45, 38, 42, 42, 51. I was close to not doing the sixth but as the sole representative of the boyz (they don't do these sessions just to make that clear) the thought of bringing shame on them filled me with a sense of foreboding doom so I set off in pursuit of the illustrious sixth and final rep. As it turned out that was probably a rep too far but never-the-less I believe tonight's set was my fastest set of six - ever. I've done a set of four a tad quicker but then that's only four. Not sure what I have planned for tomorrow - probably a rest day. Birthday thought for the day: Growing old is mandatory; growing up is optional. PS There must be a problem with my post because my invitation didn't turn up. I was looking forward to a game of spin the plate, musical chairs and pass the parcel - maybe next year, eh, Nick? It wasn't my fastest session on the track tonight. Not my slowest so I'll take it. We were in reduced numbers tonight with Sean, very rarely absent, at a function and Jamie continuing his awol status. Nick and Harry made up the numbers as did a visitor. We ran five sets of 500m/300m reps with 60s recovery between the 500m and 300m and 90s between sets. It was a chill night and I think it chilled my running. Apart from the first 500m in 1:29 the rest were all 1:33/34's and the 300's deteriorated from 53s down to 56s before finishing with a flourish in 52 - but only because some damn fool tried to overtake me - yes the cheek of it - in the back straight. I nearly caught Harry but his youth just had the edge. Not sure where training is tomorrow. I shall try and find out. Although I might not be arsed to do any - we'll see. Thought for the day: The best time to plant a tree is 20 years ago. The second best is now. Had a full day at work today. Stood in a field with my laptop, watching the world go by - well actually I did a bit of work - which did actually work - in the end. Anyway, I didn't have time to hit the gym so today's rest day really did turn into a rest day - don't get many of those to the pound - sorry, kilo - or is it monetary pound? oh, I don't know - wish I'd never started that now. Anyway, I shall store today's energy and release it on the track tomorrow - providing I don't explode in the mean time. And talking of exploding, you'll all be glad to know that when I awoke this morning the leg was still soundly attached - which was nice. Thought for the day: Today is the tomorrow that you worried about yesterday. I know, I know, waaaay too much information but the left side of my groinal area is sore - is groinal a word? probably not, moving on quickly. Obviously, it didn't stop me training because I'm not normal - in a nice way, of course. I even managed to complete the entire session - with my leg remaining attached to my torso - always a bonus, I find. So to the session. We ran on the road tonight - well, not actually on the road, it was the pavement, anyway, it wasn't the grass for us tonight. It was longer reps and we ran four 5 minute reps of 1.46km with 2 minute recoveries - OK, the lads ran five minutes - I took longer because I'm old, decrepit and slow. I found it tough going, especially into the strongish wind and the lads burnt me off good and proper. I were gert miles behind. But it's good to run with them because once again I was close to shortening the rep length and once again I couldn't live with the shame so battled on to complete the session. My splits were actually pretty decent - for me. I'm surprised by the speed really, 5:09, 5:34, 5:16 and 5:29 (the faster ones are net downhill and the slower, the return journeys - if that makes sense). That's an average of 5:22, which equates to 5:31 1500m pace into a tough wind. Anyway, I shall be giving myself a rest tomorrow - maybe a burn on the bike down the gym but no running. Then I should be ready for Wednesday - as long as I don't wake up tomorrow to find that my leg has dropped off. Thought for the day: Indulge yourself by being generous - help someone out, perform an act of kindness, offer a compliment. The person who will feel most uplifted by you having done so is... you. It was up to Ashton Court today for a recovery run after yesterday's return to fell racing and what, for me, was a sublime few minutes at Sugar Loaf. It was just the four of us, Sean, Rick, Mike T and me. Sean raced in the National Cross Country Relays yesterday but from the outset he was off the front today - I don't reckon he ran fast enough at the relays. Anyway, Mike T was right up there as well but I wasn't - I couldn't keep up. My quads were feeling the strain from yesterday - we're not talking wrecked - just heavy. I ran for just under the hour while they put in just over. All in all it was a good effort on a nice crisp morning - what more could you want? - well loads actually but that's a story for another day. And I should be recovered ready for tomorrow's reps up on the Downs. And here, for your interest, is the route. What a feeling inside when you get to the top. Heart pumping, legs burning, you know you're alive. Then off back down at terrible speed. It's much too fast, will I survive? Adrenal explosion, oh what a rush. Fight to the finish, urge muscles on. Cross line, race complete, what a feeling inside. I'm so sorry to subject you all to that! When the urge takes hold, I can't control and the pen doth scribe across the page - I'm going to have to up the dosage aren't I? Thought for the day: Some people bear three kinds of trouble - the ones they've had, the ones they have, and the ones they expect to have. What a difference a week makes. I felt strong today - not super human but never the less strong. Last week I found the going so tough but that practice run really did do the world of good. I ran hard today and felt good. Far better than I thought I would. I think I may even have squeezed into the top twenty in a field of about 100 give or take some. And I also managed to beat Stroud's Phil M. We've had a few good races this year but he usually ends up getting the better of me. I thought it was more of the same today as he came past during the first climb but I soon got back on level terms and he followed in hot pursuit all the way, finishing on my heels, just seconds behind. Without him pushing hard from behind - no, cut that out - I would have eased back a bit so I thank him for chasing. The Sugar Loaf race is 5.5 miles and 1,450ft of climb and I finished in a time of 43:43. Any time inside 44 minutes can be considered pretty decent. Now 44 is a good time, mind you, nothing wrong with 44. If you get 44 you can be happy. If I hadn't managed to get 43 I would have been dead chuffed to get 44 - it's just that you know you've really made it when your time begins with 43 - have some, couldn't resist, sorry, you know I'm kidding. Well done to Helen F for not only winning the women's race - and she really was in a race - and a close one at that but she also broke her own course record by over two minutes. And well done to Patrick Woodisse for a top ten finish. Thought for the day: Patience is bitter, but its fruit is sweet. No training today but the cold is much better. The sneezing has been confined to one or two short bursts and the sniffles are much reduced. So it's good news for tomorrow. It might not quite be all systems go and my main rocket boosters might be due a main service but hopefully my retrorockets will see me to the top of Sugar Loaf tomorrow and with luck my heat shields will stay attached on the way back down - and yes, I know retrorockets are used to slow against the direction of motion - we can't all be rocket scientists can we? Thought for the day: Failing to prepare is preparing to fail.